Journal of Soft Computing and Software Engineering (JSCSE) is focused, double blind peer reviewed journal that is now being published monthly and is published by Advance Academic Publisher and will be send to Index by the following International Agencies and institutions: EI, ProQuest, DOI (CrossRef), DBLP, Ulrich's, INSPEC. 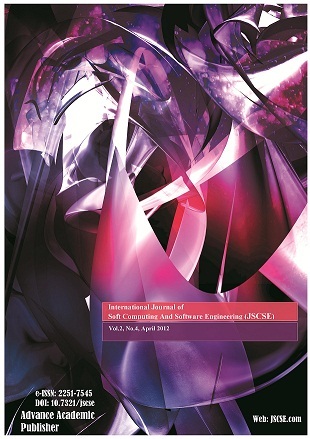 JSCSE has been regularly published since 2011 and now has a well reputed international standing and invites contributions from researchers, scientists, and practitioners from all over the world. Currently, JSCSE is under review and evaluation by Thomson Reuters (ISI) and we'll publish Thomson Reuters (ISI) evaluation result. In addtition, Please check the letters from some popular index to JSCSE: SciVerse (Elsevier, Scopus, ScineceDirect, as external source), DOI (CrossRef) , Ulrich's, IET INSPEC, DOAJ, SCIRUS, Harvard University, Cornell University, Cabell Directory (search JSCSE), Google Scholar, DBLP (Sample Paper).